You may be at a crossroads at this stage in your life not knowing which way to turn. Or, you may be seeking a solid, realistic opportunity without much luck. If you’re in trucking, maybe you’re getting tired of climbing in and out of your cab. You would like to get the best freight broker training – but you don’t know where or how to start. May Not Be That Difficult or Complicated to Get Started In! In the next several minutes, I’m going to take you through an outline of my system where you will learn about starting and maintaining a PROFITABLE freight broker business. My program is not a general introduction – it is a detailed and comprehensive solution to ALL the hurdles you may be facing. Not just for getting your broker authority (that’s where we usually begin) but the other requirements like learning what tools you will need and how to properly use them, finding shippers who are receptive to working with you and ready to give you loads; or, how to find and prequalify motor carriers, including what you’ll need to know in the legal realm to reduce your exposure to broker liability. This is the best freight broker training with its comprehensive materials and tools that are so powerful you’ll end up saving thousands of dollars as I help you cut through the mustard. Manufacturing, distribution, freight, logistics, transportation, supply chain and trucking – all of these are integral parts that you will come in to contact with. If this is what you are seeking, this may be the most important message you’ll ever have read. My name is John Thomas. I’ve been training individuals for 15 years on how to start, run and succeed in their own freight broker business. 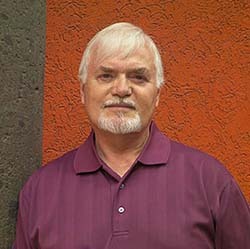 In fact, I’ve been working for over 25 years with other small business start-ups before I got into broker training. Education, training and mentoring are my passions! This is the best freight broker training program and is based primarily upon my own previous brokerages, Atex Logistics, Inc. and Atex Freight Brokers, Inc. (MC# 453560). So, I’ve “been there, done that”. When I got into brokering, it took nearly four months just to get organized and ready to go. Most of the time I didn’t know what I was doing and finding help in this “tight-lipped” industry is like trying to find a four-leafed clover in a sand lot. Eventually, I started getting loads – slowly. Then one day, after working with a particular shipper for several months, I got a phone call from him. He said, “This is Ramon”. Then he said, “I’ve got a load. I need a truck”. After making who knows how many phone calls, finally – FINALLY someone called ME instead of me calling them! And, it slowly mushroomed from there. There were some days I could hardly get away to the bathroom! Freight Broker Training Out There? This comprehensive training shows you HOW to run a business – a successful business at that. You see, I knew these industries were gigantic! Trucking, freight, logistics, the supply chain and freight brokering – they are immensely huge! In these huge industries, there are thousands and thousands of potential customers waiting for YOU right NOW! If you would like to get on board and start moving YOUR portion of these thousands and thousands of products being shipped every day, please continue reading. As a freight broker, you will coordinate the complete transaction between shippers and carriers and you will receive a commission for your matchmaking skills. Further, after gaining the trust and confidence of both shippers and carriers you will get repeat business; you will guarantee yourself an income stream for as long as you are in business. After several years of brokering and documenting a huge portion of my operations, I started my freight broker training for new brokers. I am glad I signed up for the course. It was a good experience and a good investment. It was patently obvious to me that a lot of time and attention was directed toward presenting a very professional package. I feel that I benefited a lot and now it’s up to me to put what I learned into practice. I’m particularly happy about having all the handouts and training book to use as a resource as I try to become more cognizant of the freight brokering business. Thank you for all your help. One of my favorite stories early in my training is about a young client who had NO idea what brokering was all about. Three months after taking my freight broker training, he called me. I’m thinking he is going to complain about not being able to find loads. Well, that’s a nice “problem” to have. He also had several big accounts to my surprise. Now, not everyone will have 200 loads or big accounts shortly after finishing training. But, one never knows. Sometimes it’s a matter of being in the right place at the right time and you had better be ready for it. And, I’ll show you some ways to jump-start your business. The question for you today is: What can YOU do to make money after freight broker training? It’s a beautiful morning and you are calling one of your steady customers – a shipper. He has a load of frozen pizzas that needs to be picked up from Chicago and delivered to Dallas. He needs a refrigerated unit (a reefer). You go through your database of carriers that you have accumulated or you’ll search one of the load boards and you call a motor carrier. You ask them if they have a truck available to pick up in Chicago to deliver to Dallas. They check their availability and say, Yes, give me the details. You give them all the details and tell them you will immediately fax the confirmation. In a few minutes you get the signed and dated confirmation faxed back and several minutes later, the truck driver calls you. He is calling to let you know he is ready to hit the road and to ask for any last, specific instructions. You give them to him and wish him a safe trip. After his delivery, the carrier sends you an invoice along with the related paperwork. You turn around and invoice your shipper. In a few weeks or sooner, you expect the payment from your shipper. When you receive your check, this normally completes the cycle. And, it’s rinse and repeat. Is it always this easy? Absolutely not. It’s a service-oriented business and it will take time to build solid business relationships. But many times, it IS this simple IF you know what you’re doing. You have an opportunity here with my freight broker training. Don’t put it off. Every day you postpone this, another broker is taking loads that YOU should have. Working As a Freight Broker? with the proper determination, experience or training almost anyone can become a truck broker. Here’s Perhaps the GREATEST Benefit! When you invest in your freight broker venture, you have a high “ROI” opportunity. What do I mean here? ROI is your “return on investment”. It’s like you giving someone a dollar and they turn around and give you five dollars back. That’s a deal you’ll want to do over and over again. And that’s exactly how freight brokering works. You invest – you get a return greater than what you invest. Throughout this message, you will learn WHAT I have to offer; HOW MUCH it’s going to cost; WHAT is in it for you; and, WHY you can trust me. Many others are already on their way … after all, it’s the BEST freight broker training out there. The best informative part is the different scenarios that we went thru in regard to talk to the shipper and carrier. Also the handouts and the e-book were very acknowledgeable. Yvonne from Texas called to tell me she got such a good rate from one shipper that she had to ask him THREE times just to make sure she did not misunderstand him. Ken from Florida called to tell me he got such a good rate from a shipper he felt “guilty” when the load gave him a whooping 25% profit! I can help relieve your guilt. Many individuals think they can learn this business on their own. The business concept is simple enough – find shippers, then find trucks and then put them together. Grab a commission in the process. However, when you strike out on your own you risk being perceived as incompetent and unprofessional. Shipping managers and others will spot you a mile away. Knowing the right procedures, the right questions and the correct methods for getting a load moved safely, effectively and efficiently will mark you as a professional. Procedures need to be done in sequence or else you mess up the entire flow of things – and, you might lose a customer. Now, right now, you may be asking yourself, “How can I find loads to get started if I’m new to the business and a small operator”? Good question. The simple answer is, If you can’t find on-the-job training (very difficult to find), you need to get properly trained by a good mentor. Before I got into freight brokering here in El Paso, I spoke with about 20 brokers here. I also spoke with some shippers and truck drivers. The information that was collected was invaluable. It formed the basis for my business plan that secured my initial line of credit. Again, based upon marketing skills, my customer acquisition advice in my freight broker training deals with the question: How many different ways are there to find customers? Many mistakenly ask, What is the “best” way or What is the “fastest” way to find shippers? The best and fastest ways may not always be the most effective. Why? A large part of my marketing training is on “going where no one else is going” when it comes to getting loads. The best and fastest ways will generally have you following the herd. You don’t want to be calling on potential customers who are being called by many other freight brokers. Getting Organized and Getting Your Broker Authority, Getting your company set-up and doing the applications for the broker authority, etc. Essential Tools of the Trade, How to calculate rates, using the load boards, rate negotiation, setting up databases, etc. Finding & Working with Shippers, Preparing the set-up package, search strategies, taking the order, posting the load, etc. Prequalifying & Working with Motor Carriers, Preparing the set-up package, finding trucks, booking the load, sending and receiving the agreements and confirmations, etc. Business, Credit, Legal & Financial Issues, Load manager templates, credit, cash management, claims, accounting, potential problems, etc. Legislation & Other Related Legal Issues CSA2010, MAP21, FAST Act, HOS, avoiding negligent carrier selection, broker liability, etc. And bonuses mentioned further below. These six steps are what took me from zero clients to working with hundreds and hundreds of them. You can learn how to do all these things no matter where you are located and no matter where your customers and carriers are located. I’ve trained clients who were in Iraq, Kuwait, the Philippines, Okinawa, Canada and most of the states in the U.S.
Work off your kitchen table, if you like. Your shippers and carriers won’t care – they just want a good, hard-working, reliable and knowledgeable freight broker to partner up with. This six-part strategy is the “missing link” that successful brokers have learned that others haven’t. This is your Step-by-Step Guide to Crafting a Money-Making Machine That Generates Repeat Business and Streams of Income for As Long As You or Your Associates Work It. Which leads us to the topic of “money”. What Is Your Income Potential As a Freight Broker? This is a frequently asked question – and a worthwhile one at that. Realistically, the income potential is unlimited. That’s the good news. The bad news? Normally, you don’t start out with a bang and, if you are starting from scratch, it will take some time to get established. However, while you are building your freight broker business, your overhead and operating expenses will be relatively low – telephone, office supplies, load boards and maybe the trust fund will be your biggest expenses – not much more depending on how you structure your business. Our freight broker training will put you on a fast track that will have you calling on potential customers in about 30 days. Some established freight brokers are doing several hundred thousand dollars a year; others are going broke. Knowing how to shift the right gears is a big factor to success. We’ll discuss using freight agents to help grow your business if you want to slam it into overdrive. Using broker agents is a different animal but worthwhile if you are willing to go down this road. So, What Are Your Freight Broker Training Options? About 25 videos that help explain most of the handouts. For the telephone and online training, you’ll be emailed a link to download the manual; we’ll get together over the phone once or twice a week for one to two hours per session. We go through the entire program – you’ll have the program in front of you on your computer – and I’ll do likewise. With each freight broker training option, except for the Home Study, you have unlimited support. I’ll stick with you as long as you need me – and you’ll let me know when that is. For the Home Study, you have up to three months of email support. Choose which freight broker training option is best for you and start thinking about a form of doing business (LLC or sole proprietor, etc.). Start searching for an available business name. I can help to some extend on these initial items. Again, be smart and get your instruction from someone who has “been there, done that”. Each training option gives you a comprehensive, step-by-step road map, explaining what to do, how to do it, when to do it, with whom to do it, why you are doing it, plus more. I’ve got a number of methods and “secrets” that I’ve used that will get your attention. Like how to create rates and check to see if they are realistic, why giving quotes is not always a good strategy, what to watch out for when negotiating with both shippers and carriers, how to approach shippers as a guest, not a pest, the pros and cons of meeting face-to-face with shippers, one effective technique that will help fight against low rates from shippers, where to go to find customers who aren’t being called on by every other broker in the country, what to expect when truckers or dispatchers call about your load and why following the herd will only lead to frustration, etc. I have put ALL this information into a detailed, comprehensive and easy-to-read training manual called: Atex Freight Broker Pro. And it contains the exact blueprint I used to take my brokerage and many clients from nothing to a full-fledged venture ready to rock in just several weeks. I originally wrote my freight broker training manual to help me get my freight broker business off the ground; since then, this blueprint has transformed the lives of hundreds of other people. But, you can’t find this for sale on the Internet or in bookstores. However, if I hear from you today, you’ll have the opportunity to instantly download and access this powerful store house of information. In fact, if I’m in the office when you or we process the order, you can have your link in about 20 minutes to download the materials. Once you own this freight broker training manual, you will learn or develop skills that you can use for the rest of your life no matter what type of business you end up in. Skills that nobody can ever take from you. Skills that are timeless – and that will work today, tomorrow … and probably 100 years from now. Make no mistake about it – this is no get-rich-quick scheme. You have to get prepared – professionally and mentally. We can help with both. You have to prove yourself to others starting out. It takes time. But once you get established, you can expect to reap 10 to 20 times your initial cost – or much more – all because you have prepared yourself with the best freight broker training available. You will learn everything you need to know to get set up and to operate a successful freight broker business. We start with various required applications for your broker authority. We do these applications together when you select the telephone and Internet or live training or with the live training in El Paso. You learn where to find shippers, how to take the order, how to calculate rates, how to use the load boards, how to book loads, how to pre-qualify motor carriers, invoicing options, collection strategies, various business applications including current legal issues that impact brokers, plus much, much more. >>> My freight broker training is step-by-step instruction. You receive an easy-to-read training manual that contains six major training topics, handouts, videos and bonuses. You won’t be scratching your head wondering what to do after this training. >>> My 1-on-1 telephone and Internet or live freight broker training is customized for YOU. With the one-on-one telephone instruction or live freight broker training, we answer your questions REAL TIME. You are not left hanging. On the last day of live training, if we have time, we’ll make some actual phone calls to potential customers. My clients love doing this – very revealing. >>> My 1-on-1 telephone and Internet training accommodates YOUR schedule. And for the live training, just call to ask about scheduling for the days you desire – week days or weekends (with a surcharge) – I am here for you. Just give me a 10 to 14 day notice on the live training. We work around YOUR schedule – not the other way around. >>> You can expect the formal telephone and online training to span 3-4 weeks; and thereafter, you have unlimited support. >>> With my freight broker training, you gain a competitive edge. Many are getting into brokering because it appears to be simple and easy. They usually don’t last long without proper experience or training. In the meantime, they bug it up for the serious brokers. With our program, you will be able to compete with the biggest and “best” – that’s a fact! >>> This training includes Load Manager spreadsheets as a BONUS to monitor each load. It includes a Sample Business Plan as a BONUS, a Broker-Carrier Agreement as a BONUS, two ready-to-use database templates as BONUSES, nearly 100 blog posts as a BONUS, cash flow templates as BONUSES and other materials that surpass anything else provided by other training programs. >>> My freight broker training is affordable. We have contact information at the bottom of this page for SBA micro financing if desired. You get great value here by avoiding other programs that require you paying for a lot of overhead, travel related expenses or even expensive software. Plus some training options fail to deliver and – how can you recover from this? >>> For the 1-on-1 telephone and Internet option, can you actually learn it over the telephone? The answer is simple: if you can run an entire business over the phone and Internet, you can certainly get trained in the same manner. You can sometimes expect very passionate, interactive and dynamic sessions between you and the trainer with either the live or telephone and online training option. >>> You benefit from my CPA experience. Why does this matter? I have learned a lot about business finances as well as marketing. >>> Use my 30+ years’ experience in working with small business start-ups. I know what works and sometimes, what won’t work. This is a powerful, effective and efficient system. 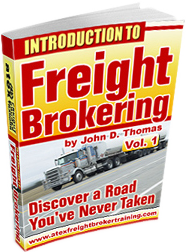 This is the best freight broker training you’ll ever find! Our freight broker/truck broker training puts you in business quicker than anything else and without losing the quality that you’ll need to be successful. You will use our training manual, handouts and videos as resources for months and perhaps years after training. Picture being able to get up each morning and start moving loads all over the country with customers and carriers located all over the place. How much would it be worth for you to have your own freight broker business where you can be calling on potential customers in about 30 days? Think about it. no Veteran discount on this training option. the same materials as above, including the unlimited support. Atex Freight Broker Pro – Home Study at your own pace. Same materials as above. Receive up to 3 months of email support. What other home study gives you ANY support? Of course, if you have a question first, email or call us at 1-888-526-ATEX (2839). Note: There are no refunds for freight broker training or the materials. The eBook training manual WILL NOT work on MAC computers. However, PC emulators may be added to MAC computers to run Windows programs. Check with your technical resource. Handouts are in MSWord, MSExcel or PDF formats. But you also get several powerful bonuses included in the handouts and elsewhere that could be sold as stand-alone products. These are designed to help you put in place vital procedures and tools that are crucial for your success. Sample Freight Broker Business Plan in MSWord format that you can modify anyway you like. This sample business plan can be used to create an effective operating blueprint or it may be used to obtain financing. • For many business owners, a written business plan is absolutely essential. • A written business plan may also be used to get input and advice from other professionals, partners or family members. • This sample business plan is about 30 pages in length. Broker-Carrier Agreement in MSWord format that you can modify by replacing the name, MC#, the DOT# and other information with your own. It is YOURS to use. This agreement is time-tested and closes a lot of potential loopholes. • A well-prepared broker-carrier agreement will put you in control. • It will establish expectations for both you and your motor carrier. • It will provide guidance in the event there is a breach or non-performance. • It will help set the framework of doing business. Load Manager Spreadsheets in MSExcel format that you can modify. There is one for your shippers and one for carriers. You will find a lot of information here in a very compact place that will help you make important business decisions. You will calculate and monitor profit margins for each shipper, days-in-collection for receivables, number of loads, your overall profit margin, plus more. Shipper and Carrier Database Templates. You will save several hours of technical work in setting up your databases using our templates. Your databases of customers and carriers become your gold mines. Your active list grows in value over time – your lists are assets like any other asset. • These templates will allow you to record, store, edit and search for important customer and carrier information. • You will open your database, select “Existing Database” and bingo! You can start adding information on the fly. Note: some clients are unable to use these templates on their computers for one reason or another; therefore, I cannot guarantee 100% they will work for you. • These blog posts will open your eyes to running your entire business. This eBook in PDF format is titled, “The Definitive Guide to Growing Your Freight Broker Business Using Broker Agents”. It gives you a road map to sky rocket your brokerage using an army of agents. It’s another resource that will give your brokerage explosive growth when you are ready for it. The economy is moving ahead at rapid clip. Our population is increasing. More jobs are being created. Wages are going up. Buyers are demanding more products and services. The result – there will be more freight, there will be a greater demand for trucks, there will be a greater demand for good freight brokers. Don’t get left out. Don’t settle for crumbs when you could get the whole pie. You can get into this coming boom IF you are ready to take action today! Trust me, others are acting as we speak. Are you going to let them get their foot in a shipper’s door first? Get Started Right Now with the Best, Customized Freight Broker Training Available! 4. We’ll check our calendars. 5. Be thinking about a business name and form of doing business (Note: do NOT place your brokerage inside of a trucking or any other type of business. You must have a separate company and broker authority for the brokerage. Don’t co-mingle). I don’t get pushy on any of this. Our freight broker training is intense and will need a strong commitment. There may be issues to discuss and you have to feel comfortable with whichever decision you make. But, don’t put this off. The sooner you call or email, the sooner you can get started in this fantastic venture. Call or email now! Once you commit to one option, we will work together to prepare your applications for your broker authority. Some of it is easy – some of it is a bit tricky and may cost you $$$ IF you don’t know what you are doing. I prefer to do the application for your MC# with you together. Note: There are no refunds for our freight broker training or the materials. The eBook training manual WILL NOT work on MAC computers. However, PC emulators may be added to MAC computers to run Windows programs. Check with your technical resource. Handouts are in MSWord, MSExcel or PDF formats. There is a lot of confusion surrounding the freight broker training field. I want to give you 6 criteria or elements you absolutely, positively must have in any training option you obtain. Does your freight broker trainer have REAL freight broker experience ? Can you train without having to purchase expensive software ? Is the training “nuts & bolts”? Is your training one-on-one or, at least, very interactive ? Does the cost of your training fit your budget? Are you getting VALUE ? Has your trainer ever owned and operated ANY business ? All materials are promptly emailed or are available for download after full payment is processed.